Irish Illuminated Manuscript: History, Provenance. One of several important eighth century Irish/Insular illuminated manuscripts, the Lichfield Gospels were written about 730 - some 20-30 years after the Lindisfarne Gospels and the Echternach Gospels, but about 70 years before the Book of Kells. Sometimes referred to as the Llandeilo Gospels, the Chad Gospels, the Book of Chad, the Gospels of St. Chad, and the St. Teilo Gospels, the manuscript is held in Lichfield Cathedral, UK. A priceless item of 8th century religious art, it has 236 surviving folios/pages, (each measuring roughly 12 inches by 9 inches) of which eight are illuminated. A further four folios feature framed text. A beautiful example of early Christian art, its eight illuminations comprise two evangelist portraits (St. Mark and St. Luke), initial pages for Mathew, Mark, and Luke, a carpet page, a Chi Rho monogram page, and a page containing the four evangelist symbols. Ulster, see: History of Irish art. Aside from its value as one of the earliest examples of illustrated Biblical texts, and a masterpiece of medieval Christian art, the manuscript also contains, in the form of marginalia, some of the earliest known examples of written Welsh. Except for one line, the entire text is inscribed in the same hand. NOTE: For the world's oldest illuminated gospel text, please see: the Garima Gospels (390-660) from Ethiopia's Abba Garima Monastery. The identity of the scribe/monk who wrote the manuscript remains unknown, as does his location. Some paleographic evidence together with textual similarities suggest it may be linked to Northumbria and Iona - for instance, the interlaced bird patterns on the cross-carpet page 216 of the book bears a striking similarity to those on a religious cross at Aberlady, Lothian, a Northumbrian site of the mid 8th century. Other textual similarities with the Hereford Gospels indicate it originated in the Kingdom of Mercian (Welsh/English borderlands or marches). Other scholars believe that the manuscript was written in Wales, not least because of its Welsh language marginalia. At any rate, by the ninth century the book was in Wales. An inscription at the end of Matthew's Gospel informs us that "Gelhi the son of Arihtuid brought this Gospel from Cingal and gave him his best horse for it." This strange statement, which seems to suggest that the text was stolen from the monastery that produced it, goes on to record that Gelhi donated his purchase to the church of Llandeilo Fawr in South Wales. The horse-trading may not have ended there for, by the 10th century, the book had been transported to Lichfield. There, it rapidly became linked with the name of St Chad, the local saint, and the manuscript is still occasionally described as the Gospels of St Chad. The opening folio actually includes a faded signature reading "Wynsige presul" which may refer to the Wynsige who was Bishop of Lichfield (c.963-975), while page four includes a reference to Leofric, Bishop of Lichfield from 1020 to 1026. However it came to be in Lichfield, it has remained there almost continuously since the eleventh century. Indeed, the bishops of Lichfield continue to take their oath of allegiance to the British crown on the Lichfield Gospels. A perfect example of early Biblical art, the Lichfield gospel manuscript features the Gospels of Matthew and Mark, as well as the early part of the Gospel of Luke. (Note: A second volume of text vanished in the mid-17th century, during the English Civil War.) The text is written in a form of Vulgate Latin in predominantly Insular majuscule script but features some uncial characteristics and is thus referred to as semi-uncial. The script shows strong similarities with other Northumbrian, Iona, and Irish manuscripts. There are eight entries written in the margin in Latin and Old Welsh. The first (in Latin) notes the gift of the manuscript "to God on the altar of St. Teilo". The altar of St. Teilo has in the past referred to the abbey at Llandaff. However, the third, fourth and sixth margin entries refer to lands close to Llandeilo Fawr. Scholars, therefore, now believe that the book was given not to Llandaff but to the church at Llandeilo. The innovations in the Lindisfarne Gospels met with a mixed reception. Some elements proved an inspiration to the next generation of illuminators, while others appear to have been quietly discarded. This much is evident from the Lichfield Gospels, a transitional work of book illustration which stands midway between the Lindisfarne manuscript and the Book of Kells. The book has suffered considerable damage and has lost many of its illuminated pages. Even so, the remaining decoration suggests that the Lichfield artist was aware of recent developments in Northumbria. The layout of the only surviving Carpet Page bears a striking resemblance to that of the second Carpet Page in the Lindisfarne Gospels. A similar affinity is also shown in the placement of some of the Evangelists' symbols, which leap over the halo of the appropriate saint. On the other hand, there has been no attempt to mimic the tepid naturalism of the Lindisfarne portraits. The languid Mediterranean figures have given way to the forceful stylizations associated with Celtic art. 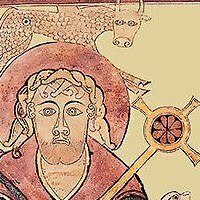 The portrait of St Luke, in particular, displays a rigid frontality and an intense, penetrating stare that is much closer in spirit to the powerful figures in the Book of Kells. The illuminated pages at the start of St Luke's Gospel form the only ornamented section of the manuscript that has survived intact. From this, however, it is possible to gain a clear idea of the decorative scheme that was probably adopted. Luke's Gospel is prefaced with a portrait of the saint, a page with the four Evangelists' symbols, a Carpet Page, and an Initial Page, and it seems reasonable to assume that the other Gospels would have been treated in a similar manner. Such a program would have been considerably more lavish than the ones employed in the early Gospel texts. Only in the Book of Kells was a more ambitious scheme attempted.  For information about the cultural activities of Monastic Ireland, see: Irish Art Guide.  For more on the history of illuminated manuscripts, see: Homepage.